Liam Neeson likes free food as much as the next person apparently, because when a restaurant in Canada advertised that the actor eats there for free — well, he decided to take them up on it. 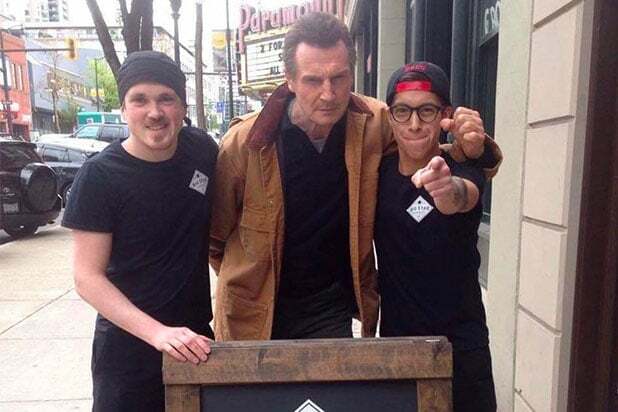 The “Taken” star stopped by the Big Star Sandwich Co. in Vancouver earlier this week after employees put up a sign that read, “Liam Neeson eats here for free.” When he actually showed up, employees wasted no time in taking a picture with the action star. “Holy f—, it worked! #liamneeson,” the company’s Instagram account posted on Wednesday. In an interview with the Huffington Post, Big Star manager Matt Prium said that he had heard Neeson would be in the neighborhood filming his new thriller, “Hard Powder.” Given that there was a chance he might walk by, he wrote the message on the chalk board outside the restaurant, offering Neeson free food. Alex Johrden, director of operations for Big Star, said the sign was put up at 11 a.m. and Neeson showed up seven hours later asking, “Where’s my free sandwich?” However, he was in a hurry and couldn’t actually enjoy the meal. "The Pelican Brief" (1993) - The oldest film on this list, Washington teamed up with a red hot Julia Roberts to bring in $101 million dollars in the U.S. and $195 million worldwide. "Schindler's List" (1993) - Neeson earned his only Oscar nomination for his portrayal of a businessman during the Holocaust who grows close to his Jewish workers and resolves to save as many as he can. The film resonated with audiences, earning $96 million in the U.S. and $321 million worldwide. "Crimson Tide" (1995) - Washington starred with Gene Hackman in this nuclear suspense thriller, which pulled in $91 million domestic and $157 worldwide. "Star Wars: Episode 1 – The Phantom Menace" (1999) - Neeson's role as Qui-Gon Jinn in the continuation of the sci-fi epic soured critics but raked in a whopping $1.027 billion worldwide, $475 million domestic. "Remember the Titans" (2000) - Washington led an integrated football team to a championship and led the film to $115 million domestic and $137 million worldwide. "Man on Fire" (2004) - Washington's turn as a vengeful assassin earned $78 million in the U.S. and $130 million worldwide. "Batman Begins" (2005) - Neeson's portrayal of Henri Ducard/Ra's al Ghul helped define Christopher Nolan's Batman films. His musings of masks, symbols and justice would shape many of the trilogy's themes and helped power the film to $207 million domestic and $374 million worldwide. "Inside Man" (2006) - Washington reunited with Spike Lee and helped revive the director's career with this smart crime thriller, earning $89 million domestic and $189 worldwide. "American Gangster" (2007) - Washington's turn as the ruthless, capitalistic drug kingpin Frank Lucas drove audiences to the theaters en masse, earning $130 million in the U.S. and $266 million worldwide. "Unstoppable" (2009) - This Tony Scott film barreled like an out-of-control train towards $82 million domestic and $168 worldwide. "Taken" (2009) - The film that launched his action career, Neeson surprised with his ease in playing a badass and audiences turned out in droves, to the tune of $145 million in the U.S. and $227 million worldwide. "The A-Team" (2010) - This adaptation of the hit 1970s TV show, with Neeson as Col. John "Hannibal" Smith, brought in $77 million in the U.S. and $177 million worldwide. "The Book of Eli" (2010) - Washington is a post-apocalyptic prophet on a mission in this underrated action film, which drew in audiences to the tune of $95 million and $157 million worldwide. "Clash of the Titans" (2010) - "Release the Kraken!" This summer blockbuster about the mythical Greek gods, with Neeson as Zeus, earned $163 million domestic and $493 million worldwide. "Wrath of the Titans" (2012) - Neeson returns as Zeus to help save the ancient world from the Titans in this summer hit, which earned $84 million domestic and $305 million worldwide. "Taken 2" (2012) - Neeson returns as a man with "a very particular set of skills" who must save himself and his ex-wife from vengeful kidnappers. The sequel pulled in $140 million domestic and $376 million worldwide. "Safe House" (2012) - Washington plays a fugitive on the run with his CIA handler (Ryan Reynolds) in this spy thriller, which pulled in $126 million in the U.S. and $208 million worldwide. "Dark Knight Rises" (2012) - The critically acclaimed third film in Christopher Nolan's batman trilogy raked in $1.084 billion worldwide, $448 million domestic. Neeson appeared as Ra's al Guhl in flashbacks. "Flight" (2013) - Washington played an extremely flawed pilot who must deal with his own failings while being hailed as a hero; the movie earned $94 million in the U.S. and $162 million worldwide. "Non-Stop" (2014) - Neeson plays an air marshal in this airborne version of "Die Hard," which brought in $92 million in the U.S. and $202 million worldwide.